It’s been so long since I’ve blogged! I’m just about done with midterms (thank goodness) and will be leaving for Spring Break tomorrow night! I just have to get through my Italian midterm first. It shouldn’t be too hard, I feel like I know more than I think I do. We have been reviewing all week but nothing can prepare me for the listening part because the Italians talk so fast and it’s impossible to hear through the little speaker that my teacher plays it through. Oh well. My other three midterms were easier than I thought, and a lot shorter. Basically just 10 short answers. The teachers here really want you to pass because they know everyone is studying abroad and doesn’t care much about schoolwork while we’re here. Last weekend was my first weekend staying here in Florence for a month, and boy was it relaxing! So nice not to have to wake up really early and get on a bus then a plane then a train etc. and we didn’t have to go out to eat every night and actually made our first “family meal” since we’ve been here! Me, Michelle and Hannah made chicken cutlets, steamed broccoli, and a new pasta dish I found on Pinterest – it was all so good! And we had leftover so we could eat it the next day too. 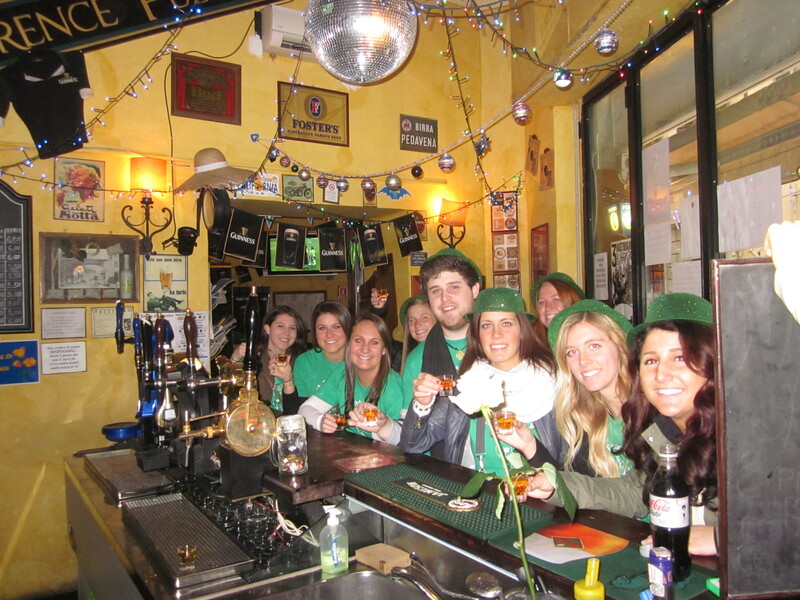 Sunday was St. Patrick’s day and even in Florence it’s crazy! We did a bar crawl during the day and all got green shirts that have The David on them with a clover and wig on they’re cute. Yesterday in my food & wine midterm my teacher made food for us after we finished the test and it was just this saffron risotto that was amazing!!! I had never had risotto before and I’m glad I got too, because that’s probably not something I would order out at a restaurant. I’m all about the homemade pastas. And pizza. And seafood. Even though midterms are over tomorrow I’m actually depressed that it means we’re halfway through the semester. Tomorrow I leave for Spring Break and will be gone TEN DAYS and miss Easter 😦 and then it’s APRIL. I’m excited because I have visitors coming in April but it scares me how close this is to over. I refuse to leave! This will probably be my last blog until I come home, unless I have some time to blog from my phone while I’m travelling but I can’t promise anything! This entry was posted in Life in Italy and tagged abroad, europe, florence, italian, italy, march, midterms, spring break, st. patrick's day. Bookmark the permalink.